Synopsis: Things are complicated. But when there is a war going on, what isn’t complicated? There’s so many things that could tip the balance and it’s hard to know where loyalties lie. But with this mysterious Voice calling the shots, there’s no telling what will happen next, or even if those fighting will see another day. With so much at stake, the group once again splits: Emily goes with Max to see if the Voice can be reasoned with while her brother Navin and his classmates journey to the abandoned city of Lucien to seek out a rescue beacon. Danger lies around the corner, but Emily and Navin are both confident that they will be able to make their way back to each other and their family. Why I picked it up: I basically love everything about this series. Why I finished it: This is the part where I quantify that last statement. Kibuishi’s series is for middle readers and young adults, but there are so many complexities to the plot and the characters that makes it appealing to readers of all ages. The reader has been introduced to a world in which there used to be a clearly defined contrast between what was ‘good’ and what was ‘evil’, but over the many years before our story has begun, those lines have become blurred. As a result, even those characters who believed they knew what they were fighting for are forced to question the motives behind their actions. And the more the series goes on, the more in depth we are seeing the conflict, not only externally but also internally for these heroes to which we have been introduced. Emily and Navin continue to be faced with conflicts and puzzles for which they and their comrades must coordinate some plan of action that will get us to a happier ending. With the group splitting once again, the drama has become more heightened, and the reader can’t help but feel nervous as each party expands and contracts. The art, in my opinion, continues to be top notch and within each panel the reader can feel the emotions coming through in the color schemes Kibuishi and his colorists have created: earth tones give us a heightened sense of anticipation as confrontations become violent, blues give a simultaneously calm but eerie quality to many interactions. The fantastic and the realistic are beautifully blended to give the reader a story that transcends not only age, but genres. As the series continues, I will eagerly follow the path our heroes are taking and look forward to seeing how the journey will eventually end. Synopsis: Max has captured the Mother Stone and Emily and her friends are the only ones who can stop him. With the power of the Mother Stone, the Elf King plans to create new amulets and create an army to destroy Windsor. When Emily seeks help from the voice of her amulet, she finds that it could be much more dangerous to trust that she initially thought. Why I picked it up: Well, it’s a series, and I want to know what happens next! 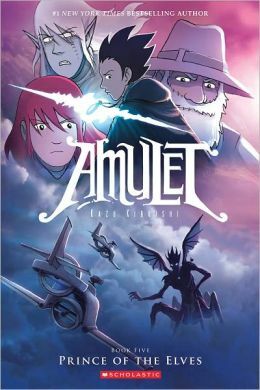 Why I finished it: Kibuishi is definitely upping the ante in this book and the story is definitely going in a slightly darker direction as we discover more about the voice of the amulet. We are also learning more about Max and the Elf Prince Trellis, adding a little different dynamic to the book as we move the focus off Emily and Navin. Both Max and Trellis both have wrongs in their past that they are trying to right which is helping to fuel their actions and helping the reader better understand their motivations for doing what they are doing. 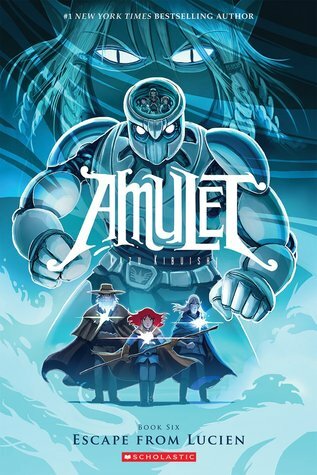 Emily’s conversations with the voice of her amulet are equally enlightening, giving the reader the impression that she probably shouldn’t be relying very heavily on the voice for advice. Then again, the voice has been at this a lot longer than Emily, so it knows what it is talking about, but it is clear that Emily needs to be in touch with herself and her own convictions in order not to fall into a trap that she won’t be able to make her way out of. I can’t wait to see how things develop as we continue to move through the story. Synopsis: Emily and her friends think they will find the answers they seek in the lost city of Cielis, but something isn’t right. Emily is separated from her family and taken to the Academy, where she is told she will compete for a spot on the Council of Guardians. Meanwhile, while her friends roam the streets they notice that the city seems to be abandoned. Is Cielis a ghost town or a trap? Why I picked it up: I am completely, totally, and utterly addicted to this series. Why I finished it: The mystery deepens further in this volume as we are introduced to more new characters that will aid or hinder Emily in her quest. This volume also as a Hunger Games element to it: young stonekeepers compete for a place on the council through war game-like trials that test their strength both mentally and physically. As if the reader wasn’t aware by now, there are more pieces of the puzzle surrounding the disappearance of the city and the seclusion of the Guardian Council, some of which are being fit together, but there is still a lot of storytelling to go before we can see the bigger picture. 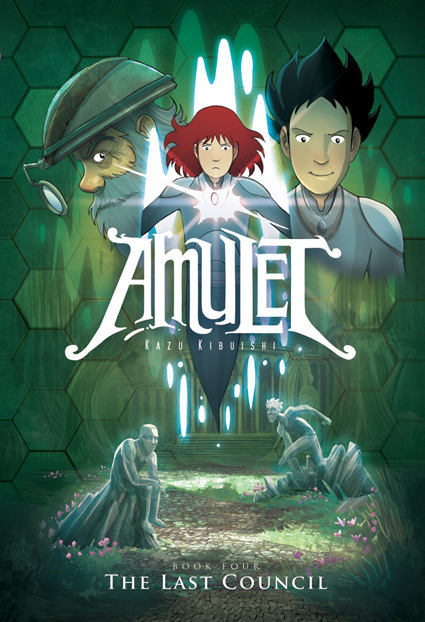 This volume is also darker in terms of the color palate Kibuishi uses for the city of Cielis; the exterior of the city is colored with soft browns an beiges contrasting with the city catacombs are deep blues and greens that heighten the tensions between Emily and the other Academy members. The drawing is very lyrical and everything flows as we move from the city streets down into the underground chambers and lends itself well to helping the reader understand the story. I’m anxious to see what comes next.